I am 14 and this is my rookie year to the sport of distance mushing. I first became interested in mushing at the age of four when my parents got me a kick sled, and we would harness up our house pets and “mush” along Powerline Pass in Anchorage. I started sprint racing when I was eight. The Rockcastle/Noble family let us borrow their trained sled dogs, streamlined sleds, and I raced them with my retired sled dog, Polar from the August Fund. At the end of my first season, we adopted Peava, a black, blue eyed beauty from Huslia. My mushing career changed significantly when Mom became Facebook friends with Jeff King, and after acquiring some of his dogs, we had a competitive sprint kennel albeit with dogs that liked to live in the house. We named it Second Kennel because it started with retired dogs and because Mom was impressed when I told her, “winning isn’t everything”. I believe that my dogs’ well-being is the highest priority. With the help of my dogs, I went on to win the 2016 and 2017 Jr. ASDRA World Championships. 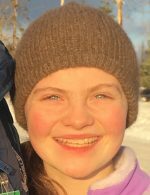 In 2018, I was one of the mushers chosen to attend Arctic Winter Games in Hay River NWT Canada and achieved three gold ulus for Team Alaska. I spent a few weeks last summer working at Husky Homestead and became interested in distance mushing. Meredith Mapes has kindly opened her Fun On the Run Kennel to me and has spent countless hours teaching me about distance mushing and dog care. I am grateful to Meredith, her dogs, and my parents for this opportunity.